Cabo speaks to many travelers—beloved by rowdy spring breakers, celebrities sunbathing on the decks of their private casas, and families lounging by the pools at one of the many resort hotels. The southern tip of Mexico’s Baja California peninsula, where the desert meets the ocean, attracts all thanks to miles of beautiful beaches, great restaurants, sunny, dry weather plus a multitude of water and land based activities. Sure there’s a touristy and commercial side and too much development, but spend a few days, and you’ll soon discover Cabo’s charm. When to go… conditions are pretty perfect from late November to mid-May. Days are sunny with temperatures in the 80’s. Don’t forget a sweater, as nights tend to be cool. Summer is hot with temperatures in the high 90s. Some visitors prefer to avoid Cabo during spring break season (March and April) when boozy college kids arrive en masse. June-November is hurricane season so you may want to keep that in mind when planning your trip. Do you need a car? That depends on how much exploring you want to do. Taxis are plentiful, perfect for short trips, but if you plan on going to Todos Santos and other excursions, it might make sense to rent a car. Logistics: Don’t be confused. Many talk of Cabo as one area, but there are two distinct cities, San Jose del Cabo and Cabo San Lucas, separated by a 20-mile stretch called The Corridor. San Jose del Cabo with its 18th century homes is laid back and sleepy compared with glossier downtown Cabo San Lucas, further to the south. MA new highway makes traveling between the two towns and the airport easier and quicker. Know Before You Go: You’re going to spend more time at the pool than in the ocean. Cabo is known for strong riptides and undercurrents, most beaches though beautiful are just too dangerous for swimming. Even paradise has its imperfections. Facelift: In 2014 Hurricane Odile hit Cabo pretty hard, an opportunity for new development and refurbishing at many of the properties. 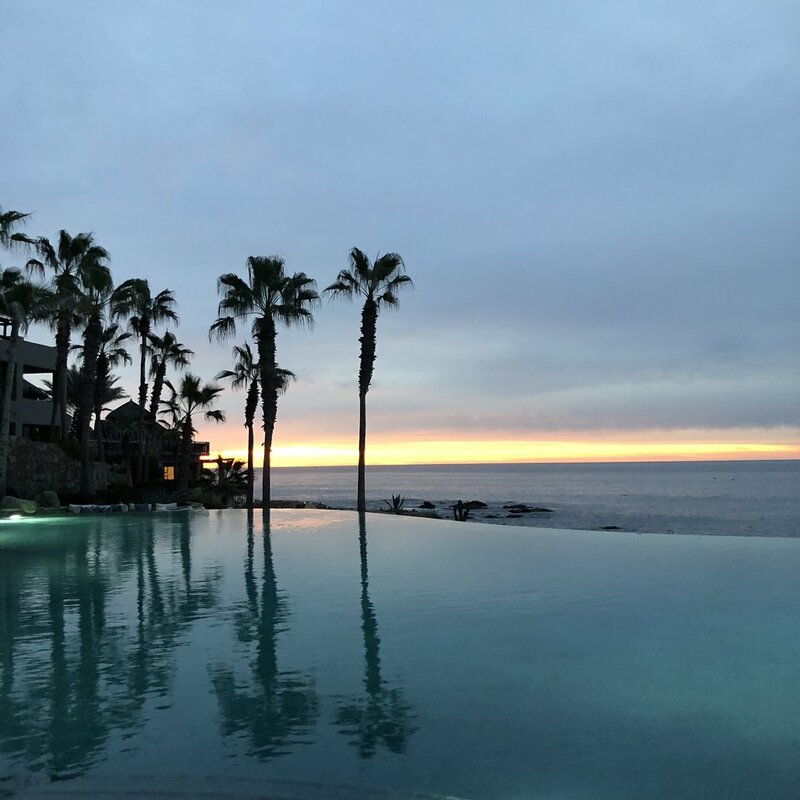 Stay: There’s something for everyone in Cabo from the hip, buzzy The Cape, a Thompson Hotel, to the established high-end luxury resorts such as The Resort at Pedregal, Esperanza, One & Only Palmilla, and romantic Las Ventanas al Paraiso. Hipsters gravitate towards Hotel El Ganzo. Newcomers are challenging the big guns; contemporary Mar Adentro by Encanto and Auberge’s Chileno Bay Resort which boasts a zero edge, triple tiered swimming pool. Plus there’s more to come, with a Nobu Hotel, Ritz Carlton Reserve and a Four Seasons opening in 2018. With different styles and personalities you need to decide what you’re looking for, admittedly not an easy choice. Be Active: Of course, there’s nothing wrong with reading your book at your hotel with only a break to hit the swim up bar, but if you want to be busy, Cabo has tons of experiences to choose from. Here are some of the best things to do. Go horseback riding on the beach with Cuadra San Francisco. Tee off at Cabo Real Golf Club, designed by Robert Trent Jones, Jr. (Pause for a photo, the sixth hole is famous, set on a dramatic bluff.) Other well regarded courses include Greg Norman and Jack Nicklaus–designed Puerto Los Cabos, and the new course by Tiger Woods at Diamante. Cabo Adventures is a one-stop shop for adventure tours from zip lines to camel rides to swimming with the dolphins. Catch your dinner during deep-sea fishing with Pisces Sportfishing or for a more leisurely day on the water, set sail with Cabo Expeditions. Embark on a boat safari with Vive Loreto, the Humpback and Gray Whales season runs Nov-March. Go deep--on a dive with Dolphin Dive Baja or stay shallow on a snorkeling trip with the Cortez Club. Get dusty on an ATV ride in Wild Canyon Park. Shop: La Coyota, is off the beaten track, a short cab ride from downtown Cabo San Lucas, located in a colonial style hacienda. You’ll be amazed at the collection of Mexican handicrafts filling every nook of the house and courtyard. Every room is a different theme, from pottery in the kitchen to linens in the bedrooms to quite a collection of crucifixes lining the hallway. Want to bring home some gifts, stroll San Jose del Cabo’s art district, a perfect place to pick up authentic Mexican souvenirs. Many shops here sell the beautiful hand embroidered colorful linens you see all over Cabo. Thursday nights there’s an art walk between 5-9, a good time to visit and check out the galleries. Spring Break for Everyone: The Office is a Cabo institution, a popular day hang out and a rite of passage for first timers. Go for a fun lunch, especially if you’re traveling with older teens--they’ll love it. (Just keep them away from the Office’s roaming “Rambo” and his tequila shots) You’re not coming here for the food, but for the scene and the views of El Arco. Organic Heaven: Just east of San Jose del Cabo is two of Cabo’s gems: Acre and Flora Farms. Flora Field kitchen at the Farms is a visual delight, a modern farmhouse with everything grown right on the property or nearby. Don’t miss a cocktail first at the Farm Bar, our margarita with fresh carrot juice was, dare we say, one of the best ever. Make reservations way in advance as it’s often booked to capacity. Acre, also farm to table, also beautiful, consists of a cocktail bar, open-air restaurant and event space surrounded by 25 acres of organic farmland. Plans are in the works for 12 modern tree houses, so you’ll never have to leave the property. A local friend told us Flora Farms is a must for lunch and brunch and that she prefers Acre at dinner, but you can’t go wrong with either anytime. 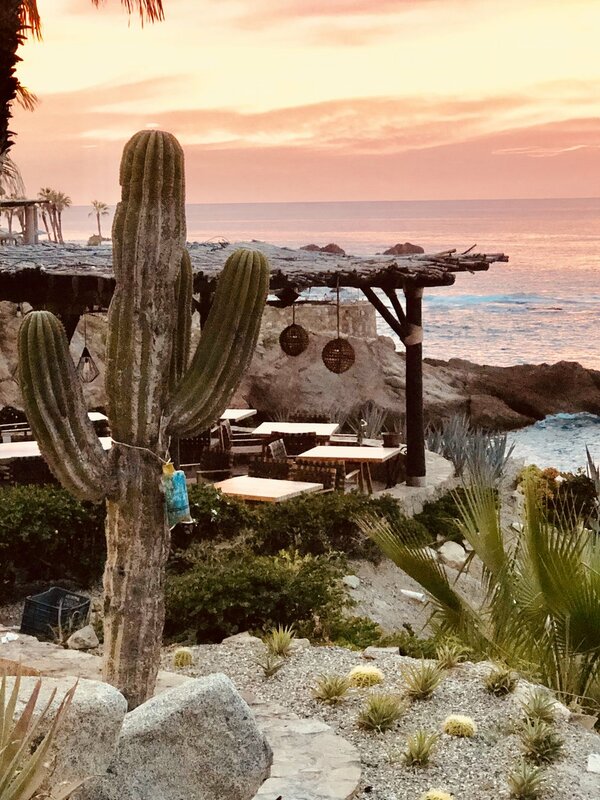 Dinner Under the Stars: Go at sunset to El Farallon at the Resort at Pedregal. Overlooking the Pacific Ocean and built dramatically into the cliffs, you begin the meal at the Champagne Terrace, then proceed to the next station to pick your dinner course and sides. Sure it feels a little staged, but with a setting this spectacular, live music, and the waves crashing below you, who cares. Another scenic spot: Cocina del Mar at Esperanza also boasts killer ocean views; set on top of the cliffs of Punta Ballena. More Eats: Head to Edith’s for traditional Baja cuisine—the Caesar salad and Bananas Foster are must-trys. Toro is excellent offering great food and live music. The casual leafy courtyard at Tres Gallos is an old school favorite of many in town. Serving Mexican classics, they are known for their mole—the food is good, not great, but it’s a fun vibe and a welcome casual night out. Need a night off from Mexican fare? Get your sushi fix during your stay and head to Nick-San, with two locations, one in downtown Cabo San Lucas and one across from the Palmilla, close to San Jose. Indulge: The resort at Pedegral has a fantastic 100,000 square foot spa, Luna y Mar Spa. You can book treatments here even if you’re not staying at the hotel –plan for a whole afternoon –there’s a sauna, steam room, saltwater spa pool and a relaxation room, all to use before or after your massage. Another world exists in Todos Santos, just 47 miles from Cabo, though recently this sleepy surfer town is heating up. The opening of the Hotel San Cristobal, from hotelier Liz Lambert of the Saint Cecilia in Austin, has brought a lot of attention to the area. The hotel, located about 15 minutes from town offers horseback riding, yoga, and fishing excursions—and is sure to attract a laid back traveler looking for a quieter spot than Cabo. It’s easy to whittle away the day here, starting with a wander around town, peeking in the artisan shops and galleries, favorites include Nomad Chic and Mixtica, a great spot for vintage finds. The best beaches are all out of town. Palm Beach is beautiful and one of the only safe places for swimming. You can go surfing on Playa Cerritos, good for all levels, just 20 minutes from town. (Rentals and lessons are available at Mario Surf School.) Hungry? 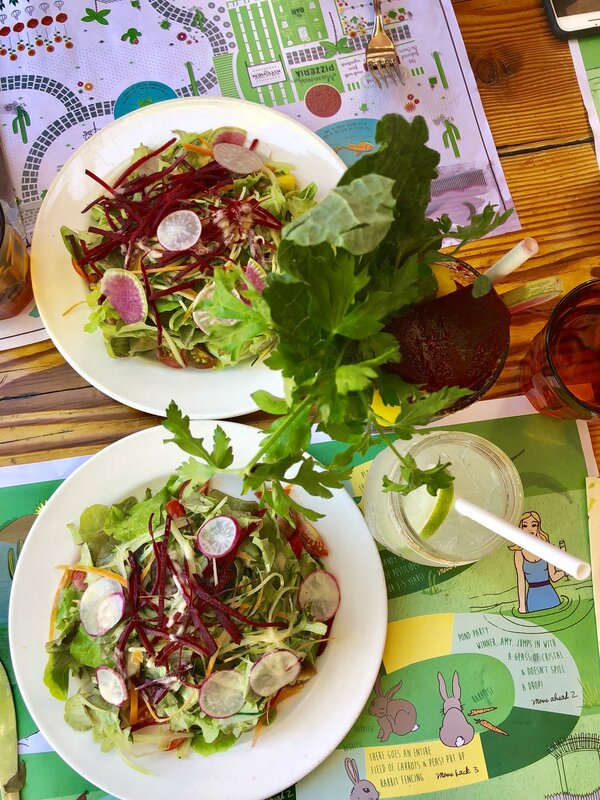 Just outside of town, set on an organic farm, everyone loves Hierbabuena’s wood fired pizzas and delicious salads. In town, Cafe Santa Fe is legendary serving delicious pasta and seafood. Dinnertime, nothing beats dining on the terrace at La Copa Cocina, at the historic Todos Santos Inn. Fuel up before heading back to Cabo at Cafe Todos Santos, the local gathering spot for coffee and pastries or at Baja Beans, right on the highway, well known for their excellent coffee. Drop in at Loveleigh, next to Baja Beans to check out their clothing, jewelry, and home décor.